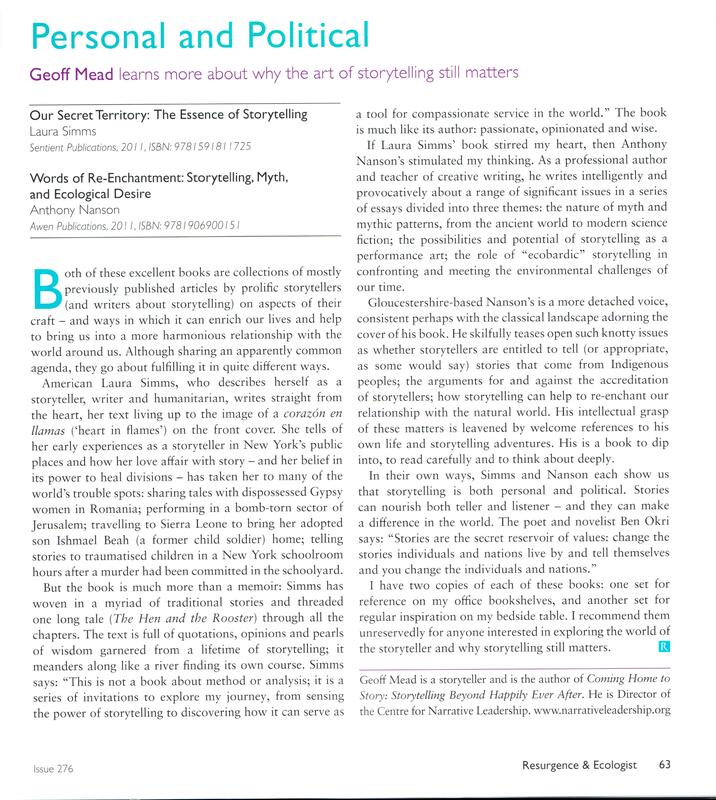 Last year I was invited to write a review for Resurgence & Ecologist Magazine of two new excellent books about storytelling by American storyteller Laura Simms and by Stroud-based Anthony Nanson. It appeared in the January 2013 edition.I hope that readers of this blog might be interested to read it – and the books themselves! 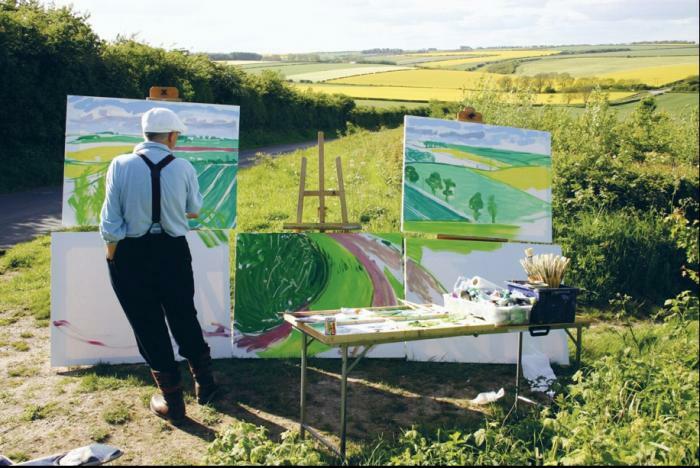 Don’t you just love David Hockney? His vigorous brushwork; his use of colour; his imagination, his audacity, and above all his trousers? Have a good look at them: serviceable tweed, capacious, high waisted, deep-pocketed, button-flyed, and designed for proper suspenders/braces (none of your cheap clip-ons for our David). 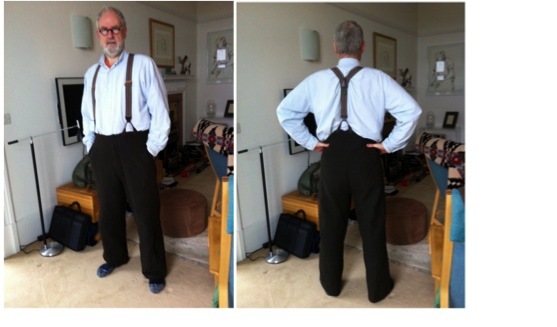 In short, they are the kind of trousers that your grandfather might have worn. And his father before him. Not actually the same pair of trousers of course, although quite possibly they would have been durable enough to have lasted several generations. I confess that I have long lusted after a pair of Hockneys. High and low have I hunted over the years yet still failed to bag a pair of these elusive creatures. Even the redoubtable Snook’s of Bridport was unable to flush out trousers of this ilk. I came to the sorry conclusion that my trophy room was destined to languish Hockney-less until the end of my days. But fret not dear reader for this story has a happy ending. There I was, stalking the cobbled streets of Le Marais in Paris, just before Christmas looking for a certain magasin (which for security reasons I cannot name) that my partner Chris Seeley had stumbled upon several years previously – one that had then stocked a select range of gentleman’s handmade clothing by English tailor Paul Harnden. Some astute detective work on the internet had revealed the likely location of said magasin and I found it without difficulty. The interior was much as Chris had described to me although seemingly devoid of gentleman’s handmade clothing. I took out my iphone and went to take a photograph of the distinctive – and rather witty – chandelier hanging from the ceiling to send to her to double check that I was in the right place. “Non! Non! C’est interdit,” declared Monsieur L’Assistant. Clearly a precaution to prevent the place being identified by unwanted foreign shoppers, I thought. Undeterred I enquired of the prickly young man if the establishment had any of Mr Harnden’s apparel in stock. “Certainment,” was his terse reply. Monsieur L’Assistant led me to a solitary clothes rail tucked out of sight at the back of the shop, presumably to stop casual customers getting over-excited. A sensible precaution because I myself began to tremble as I saw hanging from it 3 long coats, 4 jackets and… a single pair of tweed Hockneys. “Je suis desolé Monsieur,” he said indicating the paucity of stock. “Moi aussi,” I replied, noticing that the label on the trousers was M for medium. The letter M and I have not been on friendly terms in the trouser department for some time now. I gestured to my comfortable waistline, shaking my head sadly. I knew it would be futile but I carried them reverently to the curtained changing room where I could at least fondle them in private. To my complete surprise and utter delight they fitted perfectly. M must mean something else in France. Fate had decided. We were meant for each other. “I’ll take them,” I said. Monsieur L’Assistant removed them to the counter, folded and wrapped them in embossed tissue paper, and placed them in a bespoke carrier bag (itself so luxurious that had it been charged for, it would have cost more than the clothes I was wearing at the time). Then came the small matter of the bill. I handed over my debit card to the cashier, wondering if it would be up to the job. The card machine whirred, clattered and pinged. I tried another card. Whirr, clatter, ping. Also refused. I stood for a few moments puzzling about what to do next, when my mobile phone rang and the synthesized female voice of my bank’s automated fraud prevention service sought to verify my purchase. In the end we came to an agreement. I told my synthesized friend quite firmly that my waist size was my business and – rather chastened I thought – she agreed to pay the bill. Debit card now accepted, I returned to the cashier and was soon striding triumphantly out of the shop, clutching my fancy trousers in their fancy carrier bag. 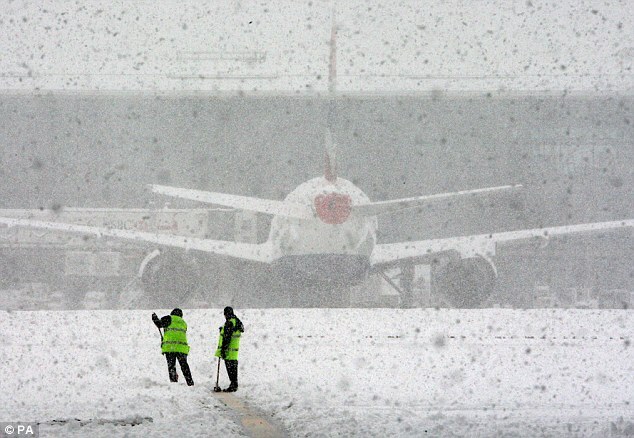 And here they are safely back home. My very own pair of Hockneys.